Are you looking to boost your Instagram marketing results, grow your followers, increase engagement, and strengthen your presence on the platform? Instagram is a tremendously powerful marketing source, but its true powers can only be seen when you have a strong strategy and make all the right actions. In this article, I’ll, therefore, present you with 3o true and tested Instagram Tips That Will Boost Your Instagram Marketing. All of which are true and tested personally by me, and have helped me grow 600K followers on the platform. It feels like this point is repeated over and over again, but that’s because it’s so vital for Instagram growth, reach, and exposure. Hashtags are a great deal breaker for your Instagram account, and if you aren’t implementing them, you’re missing out on a huge untapped potential. A lot of people vouch for using “the most popular hashtags” with the argument that these are hashtags that are most popular, thus letting you reach more people. Only that it’s not true. It still amazes me that the motto quality before quantity applies on literally everything in life, and with hashtags – it’s no exception. When choosing the hashtags, you should only use hashtags relevant to your niche. Apart from “The most popular hashtags“, tags that are relevant to your niche only attracts people from your target audience. The popular hashtags mostly attract spam users, bots, and people who have no interest in you or your page. The maximum number of hashtags you can use is 30, so why not use it? I always personally recommend using them all, because that’s what I have found to be most beneficial. 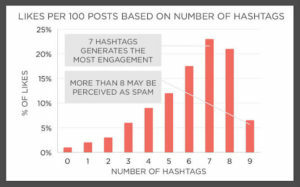 According to a study by Socialfresh, 7 hashtags generates the most engagement. But if you think about it, using more hashtags makes sense. By using 30 instead of 7, you can get your post seen on 23 more places! You want to boost your marketing results. And hashtags help you do that in a very effective way. Look for people who are mentioning and talking about your brand and repost their content. As a brand who are selling physical products, this is extremely important as it offers a ton of free exposure. When you repost their content, you encourage your customers to share content of their products or your brand, which will not only work as free exposure, it will also work as a very impactful peer-to-peer recommendation. Considering the fact that consumers are more likely to trust influencers than brand content, it’s easy to understand just how effectual using your audience as marketing sources really are. 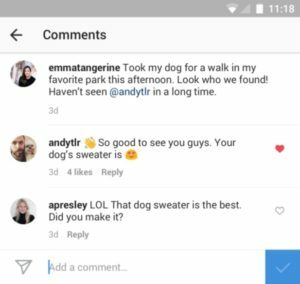 Many of the major brands can be seen sharing user-generated content on Instagram – and that’s because it works. It makes their audience more engaged, and it has a completely different level of trust. 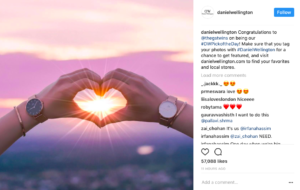 Watch brand Daniel Wellington have learned the importance of this, and now shares a user-generated image every single day to help boost engagement and encourage others to share pictures of them wearing their watches. 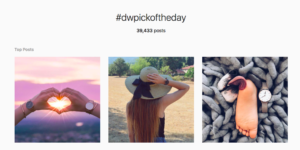 What’s more, their hashtag #DWpickoftheday has been able to accumulate 39,644 posts! That’s a ton of free exposure!! Geolocation is the location that you tag your post with. More accurately, check in your post to. For example, if you’ve taken your photo in New York, you want to set the geotag of that post to New York. When you use geotags, you take advantage of another place where you can get your content seen. This means 31 places including the 30 hashtags where your post will be visible to non-followers. Statistics have found that 79% more engagement than those without, so obviously, you want to take advantage of that. Almost all brands who take social media marketing, and particularly Instagram marketing seriously have a so-called personalized hashtag. A personalized hashtag has a lot in common with point number 2. That’s because usually, the best way for brands to encourage customers to share content related to the brand is to create a personalized hashtag. There’s a whole art behind a personalized hashtag – and many parts that go into creating a successful one. To learn all about it, you can read how to create a successful personalized hashtag, but in this article, we’ll go over the most important part of a hashtag. When you have a personalized hashtag, you build up a community which people wants to be a part of. This means that automatically, you’ll start gaining more traction and more people who start sharing content! Just think about the exposure this means for the brand. When someone sees their hashtag, they get curious about the hashtag and its meaning, and of course, they click on it and can’t help but discover the brand’s social media page. Engaging with people in your industry is, in my opinion, one of the most effective ways to grow your followers and get discovered by potential customers. Like, comment, and engage with their posts in order to get discovered by them. When you do that, they’ll become aware of your brand, and brand awareness is the first step of generating a sale. If people don’t know about your brand, how can they buy from you? Where to find people to engage with? Instagram currently boasts over 700 million active users, so finding people won’t be a big challenge. However, what really matters is finding people who are interested in your industry. Not just anyone, because if you engage with them, they will be much less likely to find your brand appealing. Instead of just engaging with anyone, hashtags are great for finding people in your industry that will be likely to enjoy your brand. Go to hashtags and search for a keyword relevant to your niche. If you sell soccer equipment, why not search for soccer. The great thing with Instagram’s hashtag search is that they now recommend hashtags based on what you searched for so that you can continue digging deep into the world of hashtags. When engaging with people, you can either follow, like, or comment on them. Or, you can do both. Don’t follow with the intent of unfollowing. While this method does work (believe it or not), it is not always very appreciated, and people might get a bad impression of your brand. Leave a thoughtful comment that is genuine. There are plenty of bots who are using the platform, and you don’t want your comment to be mistaken as a bot comment. Make sure your comment is genuine and comments something from the post. Also, why not throw in a few likes to increase visibility as well? Influencer marketing is tremendously powerful for brands. Just look at the statistics it is able to generate. They are actually quite remarkable. Depending on your marketing objectives, influencer marketing can do a lot of you. It can help grow your Instagram followers and strengthen your presence on the platform, it can increase brand awareness and generate traffic, and it can generate tons of sales. In fact, a study found that brands get $6.85 in earned media value for every $1.00 of paid media. In order to get good results, it’s vital that you only work with influencers relevant to your brand, and influencers who have a high engagement. The following count is least important, so don’t let yourself get fooled by a high number of followers because that could just be faked with bot followers. You can use Veloce influencer directory to find influencers who suit your brand’s needs within seconds. Simply choose the criteria relevant to you and click search. All influencers are carefully hand-picked which ensures no fake followers, and only individuals with a high engagement in the search results. The golden rule of giveaways on social media is the following: The better prize you have, the more contestants you’ll have. However, as a brand, the best is always to giveaway a product of yours. Depending on what you are selling, it is most often the easiest method of running a giveaway, and also most affordable. Again, if you are selling cars, that might not be a good idea – or it might. When giving away your own products, you draw interest around them, and chances are, you’ll generate some sales as a result of the giveaway right away. You might think it’s enough to only post a random image, then write all necessary information in your caption, however, that’s not the case. You’ll find much more success by creating a giveaway image like the one below. Not everyone reads Instagram captions, and might just scroll past yours. How could they possibly know about your giveaway then? 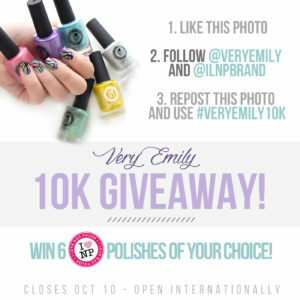 Create an appealing image that clearly states “Giveaway”, then include all the necessary steps to join. Many brands neglect the importance of Instagram captions and write them in second though. While it is true that the content itself is more important than the caption, it does by no means mean that the caption isn’t important. In fact, the caption can help people stay longer at your post and not scroll past it after one second. Having an appealing caption that sparks your audiences’ interest has two benefits. First of all, Instagram’s algorithm that decides what you get to see in your feed looks at how long you look at posts. The longer you look at a post, the more relevant the post is to you – in Instagram’s eyes. Secondly, your caption helps complement your image, and add context to it. Also, if written properly, it contains text that can help you drive more sales and make conversions, such as powerful call to actions. If you don’t use the captions for that, you’ll miss out on an important opportunity to impact your audience. Bright images perform 24% better than dark images. 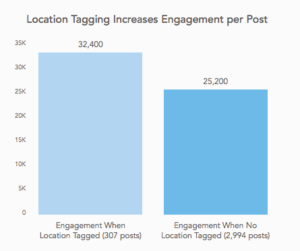 By simply increasing the brightness of your post, you can get a higher engagement and reach more people. Thankfully, you don’t have to download photoshop, edit the image there, save it, then send it to your phone and upload it. 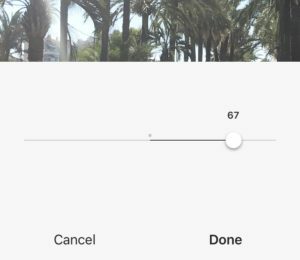 With Instagram ‘s built-in photo edit tool, you can edit your images quite a lot. However, for now, we’ll stick with the brightness tool only. To increase brightness, tap to post, then tap the “Edit” button in the bottom right corner. Increase brightness to what you think is suitable. Studies by the Institute of Customer Service reveals 1 in every 3 customers turns to social media to seek advice or communicate with a business. That’s quite a large number, and this just goes to show that there’s a switch that is taken place in the customer service industry. Customers are transferring from the old customer service tools such as Phone and Email and moving to social media instead. If you don’t use social media to meet your customers’ demands, you’re missing out on great opportunities to show that your customer sevice is the best. Aso, by showing your audience that you are open to handle customer service questions on your Instagram, you can attract potential customers, and spread awareness about your Instagram presence. If people are taking the time to comment on your post, they ‘re expecting a response. Not only will listening to our customer’s comments, then taking your time to answer them make them continue posting, it’ll also show them that you care and that you value them. Also, by engaging with people on a regular basis (comment section being one place), you can build up genuine relationships with your audience, that will lead to word-of-mouth marketing because of the great impression they’ve gotten of your brand. Live video is a great way to build a deeper connection with your audience in real-time. Run Q&As, share behind the scenes video of your office, introduce your team members and so on. When you share content with live video, it makes it so much more engaging for people, as you are able to read their comments right on the spot – even if they are hundreds of thousands of miles away. It becomes more clear for people – and the gap between you and your audience significantly reduces. Last but not least, Live video helps put a face to your brand. Nobody likes talking to a fancy logo and a brand name. People want to talk to real people, and they want to know who they are talking to. 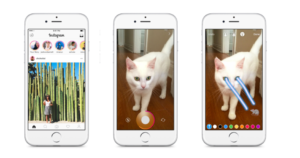 Instagram Stories has grown immensely in popularity in recent time. As of August 2017, Instagram Stories had 250 million daily users compared to Snapchat’s 166 million. Stories is a great way to share “on the spot” content that engages people. Your Stories don’t have to be polished to perfection like your Instagram posts, instead, they can just be engaging videos or photos that get people engaged. The great thing about Stories is that after 24 hours, your Story disappears, which means you’ll always have fresh content. Also, the opening rate is relatively high, so you’ll get a lot of people seeing them. It is for your audience that you share content, so obviously, getting to know them is vital in order to know what kind of content you should share, and how you can speak to them in a more engaging way. An Instagram profile can tell a lot about a person. in fact, some people document their whole life on Instagram. By taking the time to look at a few instagram accounts each day, you’ll soon begin to see trends in what type of people you are attracting. Are your followers people from your target audience, and people who are your customers right now? By learning who your followers, are you can implement information you get into your social strategy. For example, if you notice that all your followers are football fans, it might appeal to them if you make a post about football. This is another way of getting to know your audience. But this time, you’ll only look at how well your posts perform and draw conclusions from that. Your followers have been following and supporting you for a while. How do you make sure the keep following your page and engage with your brand? 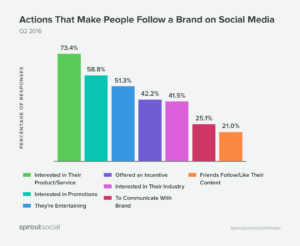 Rewarding your followers is a great way to make them want to continue following your brand, and there is several ways you can do that. Did you know that 58.8% follow a brand because they’re interested in promotions in the form of discounts and special deals? When handing out coupons and discounts, you can do it in a number of ways that will benefit you as well. There are literally hundreds of ways you can make promo sharing more fun and only your imagination sets the limits. Don’t overwhelm your audience by posting countless of posts a day. You don’t want to clog up their feed because as a result, they’ll unfollow you. Apart from the “Best times” of which you should share your posts, the statistics are far more agreed on the “ultimate number of posts” you should post daily on Instagram. Buffer has found that 2 posts a day are the best number on Instagram. While the statistics vary between 1-3 posts a day, the best is to experiment with those numbers and see what your followers prefer. Before the introduction of Instagram’s algorithm that now decides what content is showcased in your audience, the time of which you shared your posts was extremely important for optimal engagement. However, as the chronological feed changed to algorithmic, it means that the posts in your feed no longer are displayed in your feed based on the time they were posted. They are now instead based on relevance. At least what Instagram’s algorithm believes is relevance. 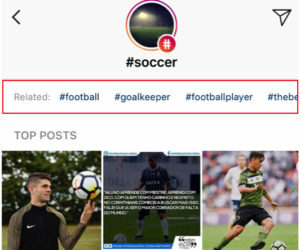 The fact that Instagram back then displayed content in a chronological order, meant that people were looking at when their audience is most active so that when most of their followers were online, they could post, thus making their post end up in the top. Now, it’s different. Because of the algorithm, content that was posted 24 hours ago, or even several days ago can end up at the top of your feed. As you’ve probably guessed, the time of which you make your post isn’t as important, however, just because there’s a new algorithm, it doesn’t mean you should completely neglect the times you share content on. Okay. We know that the hours we post content isn’t that important anymore. But just to clarify, it doesn’t mean it should be ignored completely, but just look at your feed and how the content is displayed! It gets very clear that content that was posted just a few seconds ago still can end up really far down on your feed. What you should do instead of looking at the times you post is to look at the days of which your audience is active. It isn’t as picky anymore with the hours, but the days can still impact the engagement you receive on your posts. If you have converted your account to a business account, you now have access to Instagram Insights. Here, you can get insights on what days your audience is visiting Instagram the most, and also what hours they visit the platform. 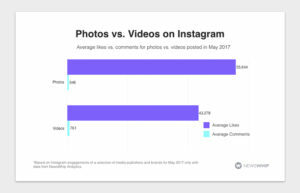 Video is extremely powerful on Instagram. In fact, by posting videos, you can get far more engagement than if you post photos. Videos offer you the opportunity to share more information and get your audience to stay longer with your post – thus giving indications to Instagram’s algorithm that your posts are relevant to them. You can tag up to 20 people in every single post of yours, except for videos. When you tag someone, not only will they get a notification but your post will be visible to everyone who clicks on the “Tagged in” button in their profile. If you tag someone, chances are, they’ll like and engage with your post. When they do, your post will also be visible in the “Latest Activity” section to their followers. When tagging, you don’t want to tag just anyone. Preferably, you should tag people who you’ve previously engaged with because these are people who are most likely to engage with your brand. You can also tag potential customers that you are trying to convert, because, in this way, you show that you think about them, and value them, while also reminding them about your brand on a regular basis. Social media trends are occurring all the time, and hopping on them and contributing in a fun way can help you gain a lot of traction. There are both events and trends. Trends are more short-lived that are only popular for a period of time then dies out. Events are reoccurring events, and on social media, they are often related to various hashtag events. Sprout Social has compiled a whole calendar for the year that brings up all the hashtag “holidays” and “events” during the year in the official hashtag calendar. I promise you, you’ll be surprised at how many there actually are. Take a look at the calendar and see if you can find some that are suitable for you. Don’t just hop on every trend you can, because that might end up harming your brand. Instead, only joining those who align with your brand’s values and those that your audience will find interesting. Your profile is the first thing people will see when coming across your brand on Instagram, and obviously, you want to make your brand as appealing as possible. Include a link to your website. 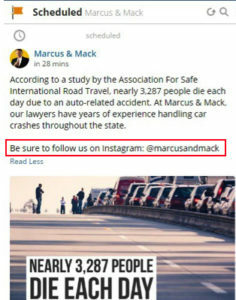 According to Instagram, it makes your page look more credible, plus it helps drive traffic to your website. Write an appealing bio. Include all the necessary information while also making it appealing and interesting to the people reading it. If it suits your brand, you can even include a fun joke that shows your personality. Obviously, you’re using Instagram for marketing so it’s understandable that you want to promote your products as much as you possibly can. However, whatever you do, don’t overpromote. This will only scare away your followers. After all, people aren’t following you because they want ads shoved in their face. In fact, you can actually get better results by promoting less. If you can incorporate your products in a seamless way so that it doesn’t seem like marketing – good for you! If this is the case, you can post more promotive content without actually making it seem like promotions. If you are active on other social platforms, why not take a minute to let people know that you are also to be found on Instagram? If people enjoy your brand and the content you share on other platforms, there’s a chance they’ll enjoy what you share on Instagram as well. A simple “Follow us on Instagram as well” is enough to let people know that you are to be found on the platform. In November 2017, Instagram started to roll out a feature that let you like other people’s comments by tapping a heart icon next to it. Liking comments is another way to engage with your audience instead of following them or commenting/liking their posts. When you like their comment, they’ll still get a notification, thus making them aware of your brand, which can lead to them starting to follow you. Since you can’t search for comments to like with hashtags, you need another way to find comments that have been made by individuals relevant to your niche. A tip is to visit your competitors and then like the comments they have received on their posts which show interest in their brand. 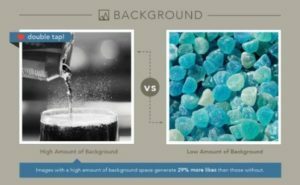 Images with blue as a dominant color perform 24% better than those with red and orange as the dominant color. Share more posts with blue as the dominant color and you can be sure to see an uplift in engagement. A simple thing that can dramatically increase your engagement. 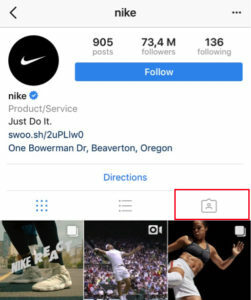 When Instagram first introduced their algorithmic feed, a lot of people were afraid that their posts wouldn’t be visible in their followers’ feeds and as a result, you could see people everywhere asking their followers to turn on post notifications. Post notifications mean that your followers activate notifications from your profile so that every time you post something, they’ll get a notification so they can interact with it immediately. 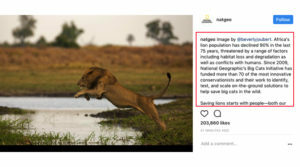 It will lead to more people interacting with your post directly when you share it, and fast interactions is an indication of popularity to Instagram which can help you get your post on the Explore page. Note: You can only turn on post notifications if you are following that page, so when asking people to turn on your notifications, make sure they follow you first. 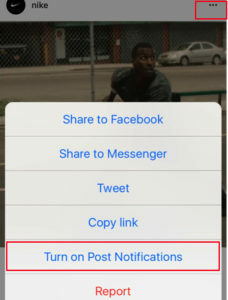 Turning on post notifications is simple. You can either turn on post notifications from a post that the account has posted, or you can do it from their profile. Choose “Turn on post notifications”. The same goes for turning on post notifications through a post only that you do it from the post instead of profile. A shoutout is when a someone tells their followers to follow someone. A shoutout for shouout, you can probably guess what it means. Also known as S4S, means that you recommend a page in one of your posts and the other person recommends your page to their followers. By doing so, you’ll get exposure in front of followers that you don’t have, and they get exposure to followers they don’t have. The best part is that it doesn’t cost anything. When looking to do shoutouts, you should only approach accounts with the same amount of followers as you. if you have 10K and ask someone with 100K, they’ll never want to do it. Also, you want to approach people within your niche. If you get a shoutout from someone that isn’t in your niche, you’ll only get expsosure to those who aren’t your target audience, and chances are, they won’t be interested in your page. The content you share on Instagram should look similar and carry a certain style. This lets your posts be instantly recognized by your audience, and help you become “known” for a certain style. When you share coherent visual content, the overall look of your page will improve – which helps make your profile look more appealing. Ultimately, this will also help you acquire more followers long-term. 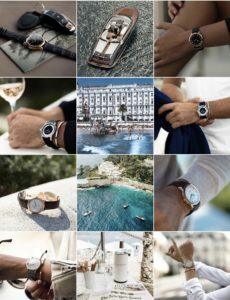 Corniche watches is a good example of a brand who successfully create content that carries a certain style and makes their content look consistent. In short, their content is easily recognizable no matter where you see it. The last tip to create a coherent brand strategy brings us to the last point. 30. Pick a consistent filter. According to a study by WebDam 60% of the top brands on Instagram use the same filter for all their posts. That’s because it helps make their post look coherent and become instantly recognizable. 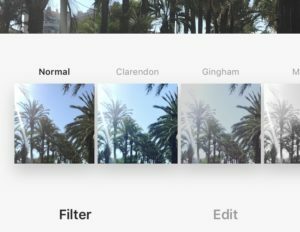 Instagram currently has 40 filters (that’s a lot) so you’re probably going to find one you like. 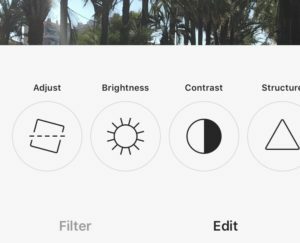 When you choose your image, you only have 25 filters to choose from by sliding to the left. However, by sliding all the way to the left, you have a settings button that says “Manage”. 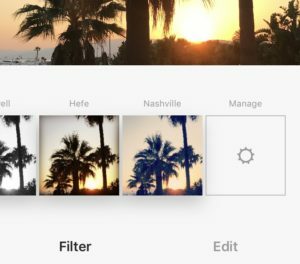 This will let you rearrange your 25 filters that are presented to better suit your needs and to make the filters you want to use more easily accessible. Whichever filter suits you, choose it and stick to it! This will give your social content an identity. the marketing benefits that come with them. Implement all or just a few strategies and you can be sure to see improvements in your results. If you’ve done them all – well done. You should start seeing some pretty good marketing results – if you aren’t already. Do you have any other tactics you use for Instagram marketing? I’d love to hear about them!